The Alabama Gulf Coast is the homeport of the largest fleet of charter boats for hire along the coast of the Gulf of Mexico. We have a diverse selection captains and charter boats available for fishing and cruising our coastal waterways. Our fleet stretches from 22′ flat bottom back back skiffs to 65′ Luxury Multi-passenger fishing charter boats loaded with the latest technology and amenities. The images below are a sample of the types of boats offering chartered fishing trips and cruises from Gulf Shores, Ft. Morgan, Bon Secour and Orange Beach AL. The captains, crews, and boat locations of our fleet changes often and AAA Charters keeps up with the changes. If you have fished with an area charter boat in the past, but can’t remember the name of the boat and/or the captain; we will try to help you figure out the mystery and arrange a charter for your group with that captain & crew if available. 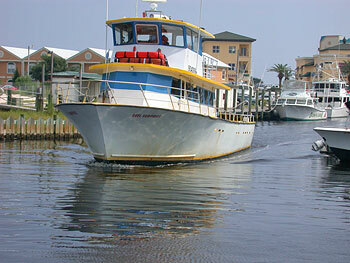 The fleet of inshore back bay fishing guides is the most rapidly growing sector of our Alabama charter boats. We have dozen of inshore fishing charters located at marinas across the Alabama Gulf Coast, from Ft. Morgan to Flora-Bama Marina located on the Alabama Florida state line . 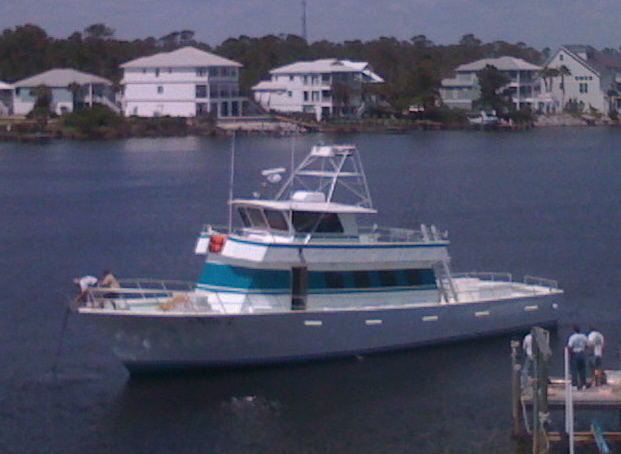 These fishing boats are typically 22′-28′ Center Console, flat bottom fishing skiffs. These boats provide all necessary bait, licenses and tackle and live wells to keep the bait alive and kicking. These charter boats can carry 1-6 passenger. Multiple boats can be arranged for larger groups. AAA Charters offers wide selection of Alabama charter boats in Orange Beach AL, Gulf Shores AL & Perdido Key FL that are available for near shore, and offshore deep sea fishing charters. There are dozens of charter boats for-hire along the Alabama gulf coast, including six passenger charter boats, commonly referred to as “six pack boats”, multi-passenger charter boats, and luxury fishing vessels. These vessels typically range from 38′-65′. Most of the offshore boats in the fleet feature air conditioned cabin, but there are a few open deck fishing charters as well. All of our offshore fishing vessels are equipped with marine heads for your convenience and comfort. Many of the salons of these charter boats feature comfortable seating areas, TV, stereos, a galley and/or a grill on the back deck available to our guests. In addition to offering fishing charters these boat can be chartered for cruises, concert transportation, weddings, corporate meetings, and special occasions. Our offshore fleet of vessels includes Hatteras, Bertram, Resmondos, Bonner, Miller, Buskins Island Hoppers, and quite a few boats that have been customized for charters by their captains and crews. Orange Beach, AL is the homeport for the largest fleet of federally permitted headboats (also known as party boats) in the Gulf of Mexico, offering daily walk-on fishing trips year-round to the amazing fishing grounds off our shores. These are the largest fishing vessels in the fleet that typically carry 20-50 anglers per trip. Party boat trips are family friendly aboard spacious vessels with air-conditioned cabins, clean marine restrooms, and a staff of mates to assist you during fishing charter. These vessels can also be booked for cruises, corporate events, and burials at sea.